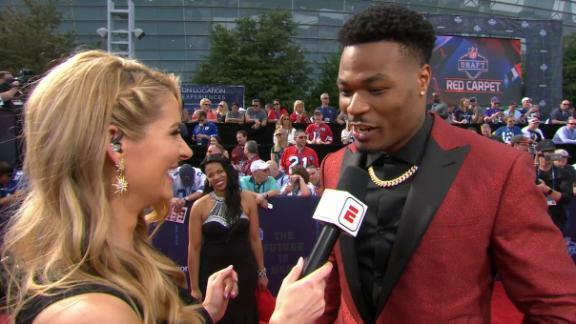 Derwin James explains the reasoning behind his red jacket and shares his emotions about being at the NFL draft. Mel Kiper Jr. compares Derwin James to another physical safety, Kam Chancellor. Louis Riddick examines which defensive stars could be on the rise heading into the NFL draft. Does Derwin James have a shot at the Heisman? The College Football Live crew weighs in on FSU safety Derwin James' chances of beating out the QB competition to win the Heisman trophy. The College GameDay crew and Chris "Bear" Fallica debate their early Heisman picks, including USC's Sam Darnold and Florida State's Derwin James. Chris Low talks with Jimbo Fisher about trash talking, Derwin James' return and facing Alabama on Sept. 2.